A mother has been cleared of murdering her three babies by a jury at Reading Crown Court. There were cheers as the jury acquitted 35-year-old pharmacist Trupti Patel - who put both hands over her mouth and let out a sob as she was cleared of three counts of murder. 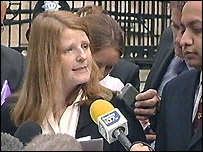 Outside the court she said she was "absolutely delighted". "Words can't describe how we've been feeling. It should never have come to court." After the verdict, the NSPCC called for an overhaul of the way child death cases are investigated. Mrs Patel's solicitor, Margaret Taylor, said in a statement: "Trupti Patel has spent the last year in torment. "She walks from the court a free woman. "She wants to publicly acknowledge the tremendous support she has received from her husband, friends and family." The jury of 10 men and one woman acquitted Mrs Patel shortly after being sent out to deliberate on Wednesday, following a six-and-a-half week trial. Her family and friends erupted with a cheer of "yes" from the public gallery as the verdicts were announced. Mrs Patel closed her eyes and began to shake as the verdicts on Amar and Jamie were read out but began sobbing when the jury foreman gave the not guilty verdict on Mia. 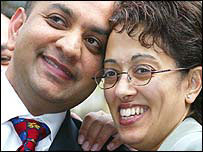 Mrs Patel was arrested following the death of Mia, the third of her children to die. She denied she had smothered her babies or restricted their breathing by squeezing their chests. A spokesman for Thames Valley Police defended the force's decision to investigate. "We took a decision that there was evidence which a jury should have an opportunity to decide on, as has now occurred," he said. The NSPCC has now called for an overhaul of the way child deaths are investigated. Chris Cloke, of the NSPCC, said: "Sometimes it can be very difficult to ascertain why infants die. "It is therefore absolutely vital that these tragic incidents are properly investigated without stigmatising parents. "The NSPCC wants to see systematic review and analysis of all child deaths by teams made up of health experts, police and social service professionals." Joyce Epstein, director of the Foundation for the Study of Infant Deaths, said most sudden infant deaths were natural and that there was a high risk of it happening with more than one child in a family. "Unfortunately, there is a current eagerness by some to view all sudden and unexpected deaths with suspicion, particularly where there is a second death in the family," she said. Mrs Patel said they now wanted to "get back to some sort of normality" and said of her family: "They have never wavered. And that's what families are all about."